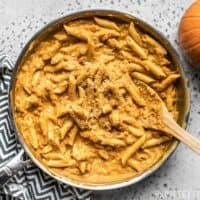 This easy tomato-free Chipotle Pumpkin Pasta is smoky, spicy, creamy, and the perfect way to celebrate fall flavors. Dice the onion and mince the garlic. Sauté both in a skillet with the olive oil over medium heat, until the onion is soft and transparent (about 3-5 minutes). Add the chipotle powder to the onion and sauté for about one minute more. Finally, add the pumpkin purée, chicken broth, salt, and pepper to the skillet and stir until the ingredients are combined and smooth. Turn the heat down to medium-low and allow the sauce to simmer for 15 minutes. During that time, cook the pasta according to the package directions, then drain in a colander. Once the sauce has simmered for 15 minutes, turn the heat down to low and stir in the heavy cream. Add the cooked and drained pasta to the skillet, stir to combine with the sauce, and let it heat in the sauce over low for 2-3 minutes. Finally, stir in the grated Parmesan, top with a little cracked pepper, and serve. I use Better Than Bouillon to make my broth, which is less expensive than boxed or canned broths, and allows me to make exactly the amount needed for a recipe. The broth contributes a lot to the flavor of the sauce, so make sure you're using a good full-flavored (not watery) broth.